Image © 1989-2002, Anglo-Australian Observatory, photograph by David Malin. 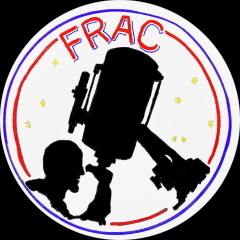 FRAC meets at the University of Georgia's - Griffin Campus - Georgia Experiment Station on the second Thursday of each month, with astronomy talks, lectures, demonstrations, movies, door prizes and more. We hold monthly club observings at Joe Kurz Wildlife Management Area. To get to the wildlife management area from, say, Hampton, come S on U. S. 19/41 and stay on the 4-lane past the Hardee’s/ McDonald’s stoplight at Ga. 92. Continue past the Griffin exit, and past the Newnan-Griffin exit at Ga. 16. Get off the 4-lane at the Ga. 362/Williamson Rd. exit, bear right (west) and set your odometer at 0.0. Go 4.8 mi. on Mt. Carmel Rd., and you’ll see a large “Joe Kurz Wildlife Management Area” sign on your right, just beyond a gray mailbox. Continue past the mailbox and sign for 0.2 mi. on Mt. Carmel Rd., and turn right at the first – unpaved – road. (We’ll have a couple of orange day-glo traffic cones to mark the road where you turn.) Turn right, follow that road for exactly one mi., and you’ll come to the top of a small hill. When you reach the top, you’ll see a line of orange cones marking Site #3 where we set up. If you arrive after dark, look for someone’s red-beam flashlight glow to guide you to the area where we’re set up. Our monthly Newsletter: The Flint River Observer - monthly club news, activity schedule, articles, astrophotos and other items of interest to our members. The Reflector - quarterly newsletter from our national affiliate, the Astronomical League. We offer expertise in selecting your telescope, binoculars, and charts or references. Members are also eligible for subscription discounts on "Sky & Telescope" and "Astronomy" magazines and 10% discount on astronomy books ordered through the club.